For the former parliamentary borough, see Calne (UK Parliament constituency). Calne /ˈkɑːn/ is a town and civil parish in Wiltshire, southwestern England, at the northwestern extremity of the North Wessex Downs hill range, a designated Area of Outstanding Natural Beauty. Calne is on a small river, the Marden, that rises 2 miles (3 kilometres) away in the Wessex Downs, and is the only town on that river. It is on the A4 road national route 19 mi (31 km) east of Bath, 6 mi (10 km) east of Chippenham, 13 mi (21 km) west of Marlborough and 16 mi (26 km) southwest of Swindon. Wiltshire's county town of Trowbridge is 15 mi (24 km) to the southwest, with London 82 mi (132 km) due east as the crow flies. At the 2011 Census, Calne had 17,274 inhabitants. In AD 978, Anglo-Saxon Calne was the site of a large two-storey building with a hall on the first floor. It was here that St Dunstan, Archbishop of Canterbury met the Witenagemot to justify his controversial organisation of the national church, which involved the secular priests being replaced by Benedictine monks and the influence of landowners over churches on their lands being taken away. According to an account written about 1000, at one point in this meeting Dunstan called upon God to support his cause, at which point the floor collapsed killing most of his opponents, whilst Dunstan and his supporters were in the part that remained standing. This was claimed as a miracle by Dunstan's supporters. In 1086 Calne may already have been, as it was later, a market town on the main London-Bristol road. The church in it was well endowed. 74 or more households were held almost outright by burghal tenure (as citizens of a borough), and the lordship of its large outlying land was divided between the king (of whom 45 burgesses were tenants) and the church. In the Middle Ages the king's successor as the lord of Calne manor and, as owner of the church's revenues, the treasurer of Salisbury Cathedral, each had the right to hold a market and a fair in the town, with two triangular market places or fair grounds. A modest hospital was provided on a modest endowment from 1248 until it provided no accommodation in 1546 and was sold two years later by the Crown. Calne had a significant woollen broadcloth industry in the 18th century, and evidence of this can be seen set around the triangular green by the parish church, where 24 listed buildings remain, five at Grade II* including the Tounson almshouses for the neediest poor and Georgian era clothiers' houses. Nearby are some of the 20 original cloth mills along the Marden. St Mary's church was extended by the generous donations of rich clothiers and wool merchants in the 15th century. Houses of the 17th and 18th centuries have external walls of stone and timber-framed walls inside. Most of the stone is limestone rubble, laid with ashlar dressings in houses of higher quality; the walls of many houses were rendered smooth. Until the 19th century, quarries beside the London road northwest and southeast of the town were sources of stone for building. A relic of 19th century lime extraction, a kiln, exists in the grounds of St Mary's School. This solid marine deposition is chiefly one chemical, calcium carbonate, and is dug in nearby pits for its main use in cement and as fertiliser on acid ground. The Wilts & Berks Canal linked the Kennet and Avon Canal at Semington, near Melksham, to the River Thames at Abingdon. Much of the traffic on the canal was coal from the Somerset Coalfield. As the canal passed through open country near Stanley, east of Chippenham, a short branch led through three locks to a wharf in Calne. The canal was completed in 1810 and abandoned in 1914. Calne's former railway station opened in 1863, the terminus of its own branch line of the Great Western Railway running east from Chippenham, with one intermediate stop: Stanley Bridge Halt. The opening of Black Dog Halt in the early 20th century provided insufficient demand to slow a progressive decline. The branch closed as a result of the Beeching Axe in September 1965, having suffered the ignominy of making the biggest loss per mile of any line in the country. Subsequently, Calne's main industry other than being a small market town was the imposing Harris pork processing factory. The factory provided employment directly and indirectly to many of the residents until the early 1980s; at its closure in 1983 it employed over 2,000 people out of a town population of 10,000. It is said that the pork-curing industry developed because pigs reared in Ireland were landed at Bristol and then herded across England on drovers' roads to Smithfield, London, passing through Calne. The factory started in the second half of the 18th century when brothers John and Henry Harris started businesses which merged in 1888 as C. & T. Harris & Co. The factory has now been fully demolished and its site redeveloped as shops, housing and a library. As a result of the closure, unemployment in the town increased considerably and during much of the 1980s Calne suffered many of the economic restructuring problems more usually associated with large cities. During the late 1990s and early 2000s, Calne saw rapid expansion compared to most other towns in the South West region, with a population which the district council projected to peak at around 19,000 by 2015 but which has since been surpassed. The Lansdowne Park housing development (completed in late 2008) has substantially increased the physical scale of the town, creating an entirely new northwestern suburb, including a new primary school, a medical centre and a small shopping area. This area in particular has attracted professional workers from traditionally more expensive areas such as Bath, Bristol, Marlborough and as far afield as the 'silicon valley' towns of central Berkshire. The development's name reflects its proximity to the seat of the Marquess of Lansdowne, whose family have resided at the nearby Bowood House country estate since 1784. The Porte Marsh Industrial Estate on the north side of the town now provides the bulk of the town's internal employment. It is home to around 100 companies in predominantly light industries and information technology. The Belgian company Deceuninck has invested considerably in this area and operates two large facilities, for production and distribution. Another significant employer is the Exception Group, an electronics manufacturer which as of 2013 was the town's largest employer with some 220 employees. In 2006 plans to build a cement production plant on the Porte Marsh site were vigorously opposed by local residents and planning permission was refused by the council. Aside from the completion of Lansdowne Park, smaller pockets of new housing were built. In October 2007, approval was given for the creation of a new £900,000 Football Foundation outdoor facility at Beversbrook on Calne's northern edge, which officially opened in April 2009. The South West Regional Assembly (abolished in 2008) planned to build 13,700 additional dwellings within the former District of North Wiltshire during the period 2006–2026. In a survey conducted via the Town Council's free leaflet in early 2010, 90% of respondents replied that the town should retain its character as a market town rather than expand significantly beyond 20,000 inhabitants to regional hub status, such as is held by Chippenham. Tourism is described in nearby places of interest below, with details of the surrounding historic and landscape attractions. Within the town the annual Calne Music & Arts Festival was established in 1975. In 2014 the town entered the South West in Bloom area of the Britain in Bloom competition and won a Gold Award for the first time. The award is judged on both the town council's floral displays and those of the community projects whose groups have entered in the 'It's Your Neighbourhood' category of the awards. Notable buildings in the town include St Mary's Church, an array of houses on The Green and the town hall. Of particular note is Calne Library which has won awards for its innovative design and was opened by the Queen in 2001. Since the demolition of the Harris pork factory and the completion of the first phase of redevelopment/regeneration in 2001, Calne has seen Cotswold stone, similar to local limestone, being used together with smart red brickwork, formerly reserved for fine historical buildings. The town centre suffers traffic congestion, with the A4 through the town close to gridlock during rush hour, due to single-file traffic between Curzon Street and Wood Street, with eastbound traffic having priority. A northern bypass road (part of the A3102 road) was completed in 2001. 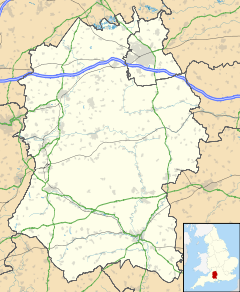 Calne is equidistant (12 mi or 19 km) from the M4 motorway at Junction 16 (Wootton Bassett/Swindon West) to the northeast of Calne, and the westbound M4 junction 17 just north of Chippenham to the northwest. The nearest main passenger airport is Bristol, 38 mi (61 km) to the south west. Calne has no railway or bus station, though in March 2007 it was designated as a National Express coach stop on route 403 from Bath to London via Heathrow Airport. The service runs once a day and has wheelchair-accessible coaches. Stagecoach West, Faresaver and Thamesdown Transport provide bus services to other nearby towns and cities such as Chippenham, Devizes, Marlborough, Swindon and Bath. As part of the New Heart of Calne initiative, a section of the Phelps Parade was redeveloped in 2009, using part Cotswold stone and part red brick, a new glass roof section and roof lining; a future large-scale redevelopment is anticipated, although not confirmed. The John Bentley School's history goes back to Bentley's School, opened in 1664 using an endowment left by John Bentley in 1662. In 1901 this was amalgamated with Calne Technical School as a school of science for boys aged 9–17. This became known as Calne County School and later Calne County Secondary School. Girls were admitted from 1903 and in 1908–09 new buildings were added to the nucleus of buildings dating from 1842. The school was later called the Bentley Grammar School. In 1957 it moved to a new building in the angle of the London and Melksham roads. In 1974 the grammar school merged with Fynemore School in Silver Street to form the John Bentley Comprehensive School, later the John Bentley School. Until 1998 both sites were used. After the buildings in Silver Street were given up, new buildings were erected on the site of Bentley Grammar, and existing ones improved. The nearest university is the University of Bath campus at Claverton Down in Bath, 19 mi (31 km) to the west. Bath Spa University lies 23 mi (37 km) away, between Bath and Bristol. The closest further education institution is the Wiltshire College site in Chippenham, 6 1⁄2 mi (10.5 km) away. Secondary schools are The John Bentley School, an academy on the southern periphery of the town; and St Mary's School, Curzon Street, an independent school for girls. The town has five primary schools and one independent preparatory school. St Mary's church has a central position in the town and dates from the 12th century. The building was greatly expanded in the 14th and 15th centuries, and its tower rebuilt in the 17th. It is a Grade I listed building. Holy Trinity church at Quemerford, on the London Road southwest of the town, was built in 1852-3. Its churchyard became the parish graveyard, as St Mary's was full. St Edmund's Catholic Church, Oxford Road, was built in 1962. The font has tiles from Stanley Abbey (which was visited by Saint Edmund Rich)  and the church received stained glass from the demolished St Joseph's Church at RAF Lyneham. Calne has a long history of Nonconformism. A Presbyterian chapel was built in Back Road c. 1695. The congregation became Unitarian after 1770, being influenced by Joseph Priestley who lived in the town from 1773–80 and preached at the chapel. The chapel had been closed by the late 1830s and was re-used by the Primitive Methodists and later by the Salvation Army. It was demolished in the 1960s. The Baptist church in Castle Street was built in the late 17th century, rebuilt in 1704 and again in 1817. The church continues in use. Particular Baptists built Zion chapel in 1836 on the street now called The Pippin; this too remains open, and is a feature of Calne's pedestrian precinct. Wesleyan Methodists built a chapel in Back Road in 1811, and opened a larger church at Silver Street in 1867, which continues in use. Primitive Methodists used the former Unitarian chapel from the late 1830s, and moved to the former Wesleyan chapel in Back Road in 1887. In 1965 both congregations came together in the Silver Street building and the chapel in Back Road was later demolished. The Free Church in Church Street was built in 1868 by a group who broke away from the parish church. The congregation is affiliated to the Fellowship of Independent Evangelical Churches. There is an Evangelical church in Oxford Road. First built in the early 1930s, and rebuilt at a later date, this was an Open Brethren Gospel Hall until at least the late 1990s. In analysis of this subject, the town is currently two civil parishes, one wholly urban and suburban and the other wholly rural and very sparsely inhabited, forming part of the substantial green buffer to the town. These parishes are Calne and Calne Without. Until the late 19th century no such division was made: the land of Calne was determined by residents in or associated with the vestry beating the parish bounds, usually annually, see ecclesiastical parish. Calne Without is not considered here as it is covered by other hamlet settlements. Statistics from 1911–1961 are for the successor Metropolitan Borough which covered a slightly smaller area. In 2011 the population reached 17,274 living in 7,113 homes. In local radio, BBC Wiltshire and Heart Wiltshire are supplemented by a community station – Eartunes Radio – who broadcast from the Carlton Business Centre on the Porte Marsh industrial estate. Calne's geographic lines are grouped under the 01249 STD prefix, which includes Chippenham and Corsham, and is listed under the Bath & West Wiltshire BT Phonebook. Local television news coverage is through BBC Points West and ITV News West Country (both Bristol-based). Calne is in the North Wiltshire parliamentary constituency, held by Conservative James Gray since the 2010 General Election. It is the constituency's largest town and lies at its southern edge. The town was previously in the Devizes constituency, with former Conservative Party Chairman and Northern Ireland Minister Michael Ancram serving as the local Member of Parliament until May 2010. Civic and local governance is through Calne Town Council and Wiltshire Council, which is a unitary authority. The town council spends approximately half of its income on parks, open spaces and the Beversbrook sports facility, and in 2013 levied an annual precept of £1.1M from households and businesses, with reserves of almost £1M. The first inhabitant of note was Edmund Rich (1175–1240), who became Archbishop of Canterbury. He was canonised and many educational establishments are named after him, notably St Edmund Hall, Oxford and St Edmund's College, Cambridge. John Pym (1584–1643) lived in Calne. He was a leader of the Long Parliament and a prominent critic of Kings James I and then Charles I. He was one of the Five Members whose attempted arrest in 1642 sparked the Civil War. Isaac Nichols, a transported convict who became the first postmaster of Sydney, New South Wales was born here in 1770. The country estate of Bowood House, which dates from 1725, lies approximately 3 mi (5 km) southwest of the town. It is the family seat of the Marquess of Lansdowne; the current Marquess is Charles Petty-Fitzmaurice. It was at Bowood that Joseph Priestley discovered oxygen in 1774; there is a plaque in the town centre commemorating this. Jan Ingenhousz repeated Joseph Priestley's experiments and found it was sunlight which acted upon the plants to create oxygen (photosynthesis). There is a pavement display outside the Millennium Library in Calne in his honour. Samuel Taylor Coleridge stayed from 1814 to 1816 as part of the Morgan household whilst writing his Biographia Literaria. A plaque on the house commemorates this visit. Walter Goodall George (1858–1943) was an athlete who set numerous world records as an amateur and then as a professional. In one of his races, he set a mile record which was not surpassed for almost 30 years. George held more than 13 world records for running at the time and still holds a world record simply for holding the mile record longer than anyone else. There are two plaques in Calne to commemorate his life, one in front of the town hall and one at ground level just inside the recreation grounds. Frederic Hicks Beaven (11 April 1855 – 22 January 1941) was Bishop of Mashonaland from 1911 – 1915 when his title was changed to Bishop of Southern Rhodesia, until his retirement in 1925. Sarah Grand (1854–1942), a feminist activist and writer, settled in Calne in 1942 after her house in London was damaged by a German bomb. She died a year later on 12 May 1943, a month before her 89th birthday. She coined the phrase 'The New Woman' and advocated new rights for women, notably in marriage. The composer Sir Michael Tippett lived in an isolated house on Derry Hill above Calne. The singer-songwriter-author Julian Cope resided in nearby Yatesbury until 2006, and lived in Calne itself for some years before he moved with his family to the village. The actor David Hemmings lived in the Old Mill in Calne for many years until his death in December 2003. Clive Farahar, the books and manuscripts expert on the BBC's Antiques Roadshow, lives in the town and has a business here. Cherhill White Horse – 3.4 mi (5.5 km) east of central Calne, carved into the south face of Cherhill Down in 1780, situated south of Cherhill village and clearly visible from the A4 Calne – Marlborough Road. Cherhill Down rises to 860 feet (260 metres). Lansdowne Monument – situated close to the summit of Cherhill Down, the 125 ft (38 m) stone needle provides views of Calne and the surrounding landscape. The mountains of South Wales and Cleeve Hill in the western Cotswolds can be seen on exceptionally clear days, as well as the cities of Bath and Bristol. Bowood House (including the 2⁄3 mi (1.1 km) Bowood Lake) – an English Heritage site, is 3.1 mi (5.0 km) to the west of Calne, accessible via the village of Derry Hill. Avebury stone circle & Avenue (UNESCO World Heritage Site) – Europe's largest neolithic stone circle site is 7 1⁄2 mi (12.1 km) east of Calne on the A4361 route towards Wroughton. Silbury Hill, the largest neolithic structure in Europe, is situated 7 mi (11 km) east of the town on the A4 route 1⁄2 mi (800 m) east of Beckhampton. West Kennett Long Barrow – the 5,500-year-old neolithic long barrow/tomb is situated 7 1⁄4 mi (11.7 km) east of Calne, south of the A4 route east between Beckhampton and West Kennett. North Wessex Downs AONB – the range's highest summit is the Tan Hill-Milk Hill ridge near Allington, at 968 ft (295 m) above sea level, 9 mi (14 km) southeast of Calne. This area is popular with hill walkers, and several hills over 820 ft (250 m) high are situated adjacent to Calne. Salisbury Plain – the northernmost point of the plain is 12 mi (19 km) to the southeast of Calne, slightly to the southeast of Devizes. Stonehenge is 24 mi (39 km) south of the town. Blackland Lakes is a large camping site on the southern edge of Calne which is popular with anglers and tourists alike. The 'lakes' themselves are in fact large angling pools. Founded in 1886, Calne Town F.C. play in the Western Football League First Division at the tenth highest tier of the English league system. Their Bremhill View ground is located on the north side of the town close to the A3102 bypass. According to their website, the rugby club was formed in the late 1920s, in part due to the influx of Welsh to the area during the depression. The Junior Imperial League, forerunners of the Young Conservatives formed the club under the presidency of either Mr Drewett or Mr L. Taylor. The team's first match was probably in Drewett ’s field where now stands Braemor Road. Their inaugural game against a Bath XV team was played on the Recreation Ground to which Calne returned in the late 1970s as a permanent home, which despite ground disputes and uncertainty – remains their home to date. It appears that a lack of local interest forced the club to fold in the late 1930s however, in 1960 the club was re-formed as Old Bentlians, though it was not exclusively an "old boys" club it did use the pitches at Bentley Grammar School. The club currently fields a 1st and 2nd XV, alternating home games on Saturdays, and also a junior team who play on Sundays. Calne SMaRTT Running and Triathlon Team was formed in 2007. They organise an annual 10 km multi-terrain running race called the SMaRTT Smasher on an out-and-back route along the cycle path towards Chippenham. Calne Divers was formed by a group of local divers to provide training to local people. The club is a member of the Sub-Aqua Association and offer try-dives to all that are interested. Training is available up to Dive Supervisor level, and all training fees are included in the club membership. The group is partly funded by the National Lottery. In 2007 Calne divers found the lost hamlet of Mannings Hill at the bottom of the largest lake at the listed private parkland of Bowood House 1 mi (1.6 km) to the west of the town. As of 2011, due to the hard work and dedication of local sports enthusiast Shaun Preen, Calne is also represented in the West of England Basketball Association (WEBBA), although home games are played at the Olympiad Leisure Centre, Chippenham, home of the 'Olympiad Flames' with which Calne basketball is officially affiliated. The club provides the local community the opportunity to participate in competitive basketball. Ordnance Survey maps published in 1959–61 show Quemerford village along the A4 east of the town, a few houses at Calne Marsh along the Swindon road on the northeastern outskirts, and Lickhill Farm standing in farmland to the northwest. Caln Township in Pennsylvania, USA, was so named because it was established by people from Calne in the early 18th century. ^ This term is in use among global economists and is of various periods in different countries and so loosely described as the Global recession 2008–2012. ^ Tesco Express replaced a One Stop grocery franchise. ^ At the time his sports, football and rugby, had different codes regarding remuneration of players and profession, therefore he was described as dual-code. ^ a b c "Population Density, 2011, Calne (Parish)". Office for National Statistics. ^ Chisholm, Hugh, ed. (1911). "Calne" . Encyclopædia Britannica (11th ed.). Cambridge University Press. ^ a b c Crowley, D.A., ed. (2002). "Victoria County History – Wiltshire – Vol 17 pp34-41 – Calne: The town to c.1800". British History Online. University of London. Retrieved 19 March 2016. Historic England. "Details from listed building database (1247409)". National Heritage List for England. Retrieved 2 October 2013. Historic England. "Details from listed building database (1247413)". National Heritage List for England. Retrieved 2 October 2013. Historic England. "Details from listed building database (1247437)". National Heritage List for England. Retrieved 2 October 2013. Historic England. "Details from listed building database (1270902)". National Heritage List for England. Retrieved 2 October 2013. Historic England. "Details from listed building database (1270992)". National Heritage List for England. Retrieved 2 October 2013. ^ Historic England. "7 The Green (east side) (456878)". Images of England. Retrieved 7 November 2013. ^ Historic England. "20 The Green (south side) (456913)". Images of England. Retrieved 7 November 2013. ^ Historic England. "Priestley's House, 19 The Green (south side) (456912)". Images of England. Retrieved 7 November 2013. ^ Historic England. "The Tounson Almshouses, 10–13 Kingsbury Street (south west side) (456532)". Images of England. Retrieved 7 November 2013. Historic England. "Details from listed building database (1271034)". National Heritage List for England. Retrieved 2 October 2013. ^ Historic England. "Lime Kiln at ST 9950 7136, in Grounds of St Mary's School, Curzon Street (north side) (456357)". Images of England. Retrieved 7 November 2013. ^ "Calne's Heritage". Calne Heritage Centre. ^ "Calne History". Shout Out: Calne. Archived from the original on 24 December 2013. Retrieved 7 November 2013. ^ "Crowds revel in royal visit". Gazette and Herald. 13 December 2001. Archived from the original on 7 November 2013. ^ Crowley, D.A., ed. (2002). "Victoria County History – Wiltshire – Vol 17 pp111-114 – Calne: Education". British History Online. University of London. Retrieved 19 March 2016. ^ Census Returns of England and Wales, 1861. Kew, Surrey, England: The National Archives of the UK (TNA): Public Record Office (PRO), 1861. Class: RG9; Piece: 1286; Folio: 97; Page: 15; GSU roll: 542789. ^ "Fynamore Primary School". fynamore.org.uk. ^ "Holy Trinity Academy, Calne - Holy Trinity Academy Calne". Holy Trinity Academy Calne. ^ "Home - Marden Vale CofE Academy". www.mardenvale.dsat.org.uk. ^ "St Margaret's Preparatory School". stmargaretsprep.org.uk. ^ "Saint Edmund – Stanley Abbey". Saint Edmund's Catholic Church. Retrieved 19 March 2016. ^ "Stained glass windows". Saint Edmund's Catholic Church. Retrieved 19 March 2016. ^ a b Crowley, D.A. (ed.). "Victoria County History – Wiltshire – Vol 17 pp109-111 – Calne: Protestant nonconformity". British History Online. University of London. Retrieved 19 March 2016. ^ "Calne Baptist Church". Archived from the original on 28 March 2016. Retrieved 19 March 2016. ^ "Zion Baptist Church, Calne". Grace Baptist Trust Corporation. Retrieved 19 March 2016. ^ "Calne Methodist Church". Retrieved 19 March 2016. ^ "Calne Free Church". Retrieved 19 March 2016. ^ "Calne Evangelical Church". Retrieved 19 March 2016. ^ Population from 1801 until 1961 from Vision of Britain Retrieved 2 October 2013. ^ "Calne Connection, Issue 50, August 2013" (PDF). Calne Town Council. ^ "The Michael Tippett Musical Foundation: Sir Michael Tippett". www.tippettfoundation.org.uk. ^ "Calne Rugby Football Club – History". Archived from the original on 23 July 2013. ^ "Calne SMaRTT". Retrieved 26 March 2015. ^ "Wiltshire's Own Lost City of Atlantis". The Independent. 20 July 2007. ^ "Ordnance Survey 1:25,000 maps of Great Britain, sheet ST97 – West of Calne". National Library of Scotland. 1959. Retrieved 13 March 2016. ^ "Ordnance Survey 1:25,000 maps of Great Britain, sheet SU06 – Southeast of Calne". National Library of Scotland. 1961. Retrieved 13 March 2016. ^ "Ordnance Survey 1:25,000 maps of Great Britain, sheet SU07 – Northeast of Calne". National Library of Scotland. 1959. Retrieved 13 March 2016. Wikimedia Commons has media related to Calne. "Calne". Wiltshire Community History. Wiltshire Council. Retrieved 19 March 2016. This page was last edited on 7 April 2019, at 14:02 (UTC).